Using Bio-Clean is safe and effective to clean your drain, septic and sewer system. What do I need for septic tank maintenance? #1 Professional-grade waste and grease eliminator. 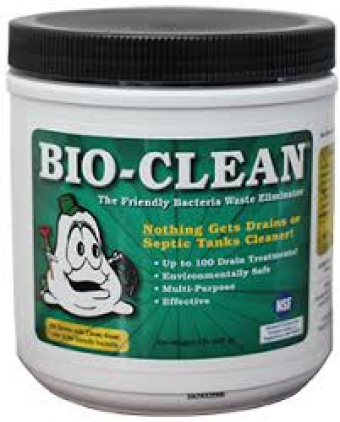 BIO-CLEAN IS...a unique blend of all natural bacteria and enzymes used to eliminate waste buildup in plumbing and septic systems. Our enzyme concentration is the most powerful on the market and is delivered to you in powder form to retain potency and maximize effectiveness. Unlike liquid treatments which usually only contain 1 or 2 types of enzymes, BIO-CLEANS powdered form contains 4 different types! This allows it to treat the 4 types of waste (protein, grease, carbohydrates, fibre) found in every system. Within an hour after pouring the bacteria into the drain, the bacteria begin to eat their way into the waste that has accumulated on the sides and top of the drain pipe. This is their natural food. They digest the waste and spread throughout your system, cleaning it completely. Easy. To purchase Bio-Clean or Waste-Go, contact Konkle Plumbing & Heating 905-563-4847. Or Bio-Clean, for a dealer near you 866.286.5931. Konkle Service area: Ontario. Niagara Falls, St. Catharines, Fonthill, Welland, Wainfleet, Fort Erie, Niagara, Lincoln, Vineland, Beamsville, Jordan, Grimsby, Smithville, Stoney Creek, Winona, West Lincoln.